Funnel-shaped wrinkled hat, the yellow chanterelles are easily distinguished due to their pronounced color and their sooty, ring less foot. For the mushroom wholesalers, they go through rigorous quality checks as soon as they are harvested. Sorted, cleaned, then checked again, they go through many verification steps before being dried. – Gray or Yellow Chanterelles : they take at least 2 hours of soaking in lukewarm water to rehydrate this type of mushroom. So that they can get back their original flavor and texture, the ideal would be to soak them the day before preparing them. 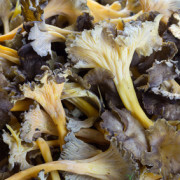 Once ready, the gray or yellow chanterelles can be fried with parsley. They also mix well with white meats and fish.